Despite having a devoted following of fans, Clay Aiken has run into his fair share of critics and haters. But building up a thick skin is something Aiken did long before fame, and on April 19, 2005, Clay revealed his experiences with bullying and shared his advice with some young people. The Dr. Phil Show was broken into three segments. In the first segment, the audience was introduced to a 14 year old young lady who was being harassed via the internet. She had been bullied to the point that she was being home schooled. Unfortunately, the bullying had not stopped as many of the students still wrote about her. She had gotten hate emails from across the country. The second segment was an interview with a parent whose 13 year old daughter bullied so much that she killed herself. The mother reported that the school would not do anything about the bullies. A 12 year old boy who was a victim of physical bullying was the start of the third segment. Dr. Phil and his son, Jay, talked to the young man about the importance of self-esteem. This is the segment that featured Clay. Dr. Phil’s introduction of Clay was very complimentary. He called Clay a megastar and extremely talented. Clay did have an opportunity to talk to the two young people who had been highlighted on the show. He talked about how important it is to accept what is important in themselves and to understand that what people say about you is not important. Clay also told the young people how brave they were for being able to talk about this on national television. He suggested that the kids who are doing good things need to stick together because they then can be more powerful that the groups of people who are doing bad things. At the end of the show, Dr. Phil gave a great plug for Clay’s book and everyone in the audience received a copy of it. Dr. Phil did tell the audience that Clay really only wanted to talk to the kids and didn’t care if his book was even mentioned. This was an excellent show and Clay was shown as a caring, intelligent man who, although picked on in his early life, was able to find out who he was and developed into a person who was comfortable and happy with whom he became. The following is a video of some of the highlights of this episode of Dr. Phil. I remember seeing that show when it first aired – how powerful it was!!! 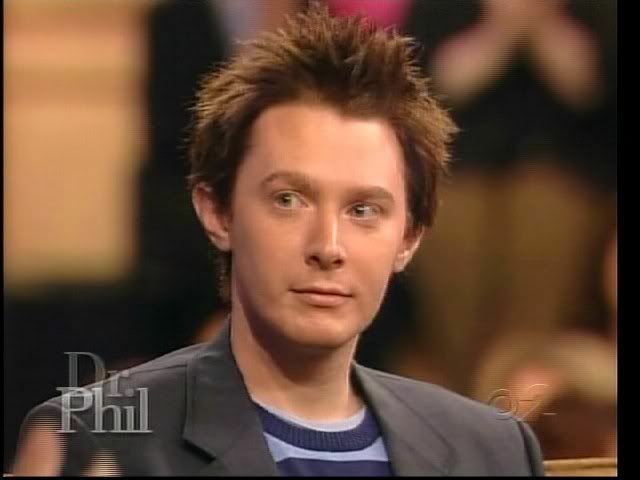 Clay Aiken is an amazing man who has used his voice for so much. While it would seem that the bullying continues, Clay continues to hold his head high and use his voice to better this world. Dr. Phil and Clay have stayed friends all this time also. Great show about bullying. You have to be at peace with yourself… I really think Clay is at peace! This was one of my favorite shows. What is sad, is bullying is still going on in schools and on the internet and does not look like there is an end to it. Not just children and teens. Adults do their share also. Thank you for the recap and video. Great blog! I saw the show when it first aired and loved Clay’s appearance. I still love it! Such a timely subject. Clay had the same experience as so many kids in school today. Unfortunately, some bullies never grow up and just hide behind “humor”. That was a great show with a great message. Clay was able to use that foundation he found in his youth to make it through some of his toughes times in his career. Bravo for those who love and respect themselves. Love and acceptance of others can only come when you love and respect yourself. Loved seeing that! I missed it when it was first aired. Clay is a wise man, having learned thru experience. His ability to work with and help kids is very evident here. Thanks for showing this! The bullying doesn’t stop–adults do their fair share of it and Clay has had to endure more than most, but one thing they can’t take away from Clay is his desire to make a difference and help kids of all ages. What a wonderful show…I do remember this…I also remember Clay talking to the two kids at the very end of the show…but it wasn’t shown on the video above…He is such a caring and compassionate man…. Wow, sure was nice to visit that show again. Clay was so smart, kind and really gave some good advice for those kids. He should know, he was bullied growing up just like they were at the time of this show. Wonder what those kids are doing now? What an awesome recap of Clay’s appearance on the Dr. Phil Show! He shared a great deal and, hopefully, contributed to the healing of the young people. Thank you for your kind remarks in the Carolina blog. Have a very special week! I loved Clay on Dr. Phil. Another great example of Clay making a difference. That was a wonderful show. I remember being on pins and needles waiting for it to air. Dr. Phil treated Clay with such respect and promoted his book by giving everyone in the audience a copy..even if Clay wasn’t even interested in having his book discussed. That’s Clay for you, humble and oh so kind to everybody. I hope he helped those kids in some way. I remember this show. I was so impressed with Clay and how he related to the young people who were being bullied. He had been through all of this himself and so they felt he understood. He gave them great advise. He has helped so many people and children in so many different walks of life, in so many countries, in so many ways. I am sure he has no clue.He is using his life for good-how proud I am to be a fan. Error: Error validating access token: Session has expired on Tuesday, 21-Aug-18 16:13:01 PDT. The current time is Monday, 22-Apr-19 07:37:07 PDT.